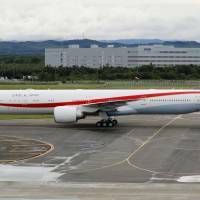 SAPPORO - A new government airplane to be used for overseas visits by Imperial family members and the prime minister arrived in Hokkaido from Switzerland on Friday morning, ahead of its entry into service next fiscal year. 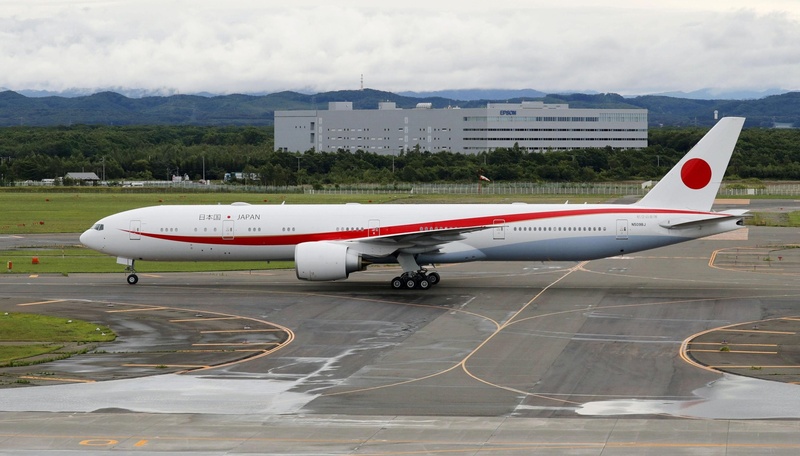 The Boeing 777-300ER, one of two planes to be newly acquired by the government, will stay at the Air Self-Defense Force’s Chitose base on the northernmost main island for trial operations and drills for crew members. Following the completion of maintenance work in Switzerland, the new aircraft — bearing images of the Japanese flag on its wings and tail and red curved lines on the fuselage — landed at New Chitose Airport adjacent to the ASDF base shortly before 8 a.m. The new plane will replace the current Boeing 747 that has operated since 1993 and will end service by late March 2019.